Hot Tub Chicken – Well That Just Sounds Fun!!! I never thought I would use my bundt pan this way!!! One of my favorite cooking shows is the Food Network’s “The Kitchen”. A panel of people from cooks to Iron Chef’s discuss various cooking techniques, recipes and tools. One of the regular hosts, Jeff Mauro, demonstrated the recipe for Hot Tub Chicken. Just the name peaked my interest! Who doesn’t love a hot tub!!! It’s not just fun, it also happens to be mighty delicious! This brined chicken with roasted veggies is moist and incredibly flavorful. So grab your bundt pan and let’s get going!!! Don’t forget to save that chicken carcass to make your own chicken broth once your done carving that chicken. My mom wasn’t known for her cooking skills, but she had a few recipes that I just loved! 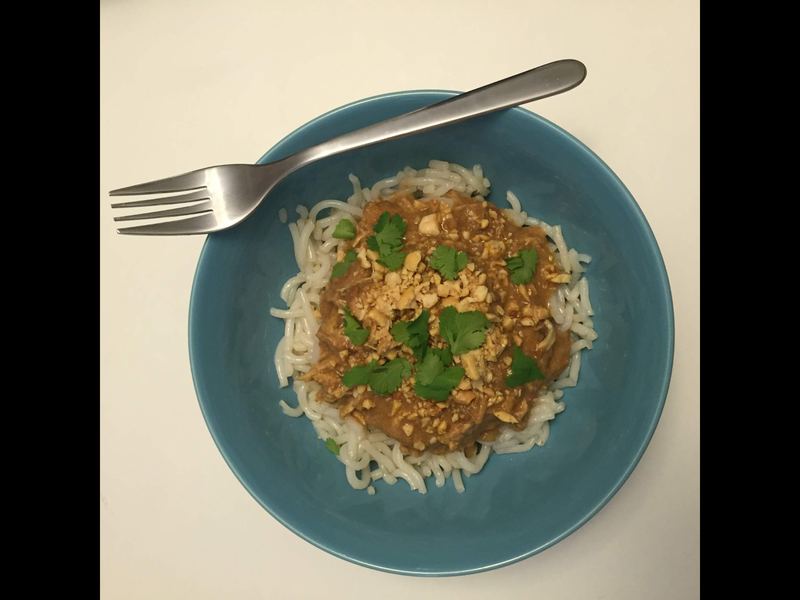 Unfortunately, I lost her recipe that inspired this dish, but I faked it and it turned out wonderfully! This is basically chicken in a white wine reduction sauce that is place in a hollowed out bread bowl. The bread soaks up the sauce and is so delicious! You eat the chicken and tear apart the bread and have a piece with your dinner. Yummm!!!! This is a visually beautiful dish and fun to eat. It’s perfect for impressing your dinner guests! This is a recipe you could play with. You may have your own saucy meat dish that would be good served in the bread bowl. Give it a try! In this picture, you might be able to see that I actually didn’t have a bread bowl, but I used sliced French bread. I had some bread on hand that had gotten a tiny bit stale and was starting to harden. It was perfect for this dish! The sauce soaking into the bread softened it right up and gave it a delicious flavor. Pour olive oil in a skillet and heat over medium high heat. Once pan is hot, place chicken in pan. Season with salt and pepper. Brown the meat on each side about 4-5 minutes each. Reduce the heat under your pan to medium and remove chicken from pan and place on an oven-safe plate, it can still be pink in the middle. Place chicken in a 275 degree oven to keep warm while you deglaze your pan. Pour wine and chicken broth in pan and stir to remove chicken bits from the bottom of the pan. 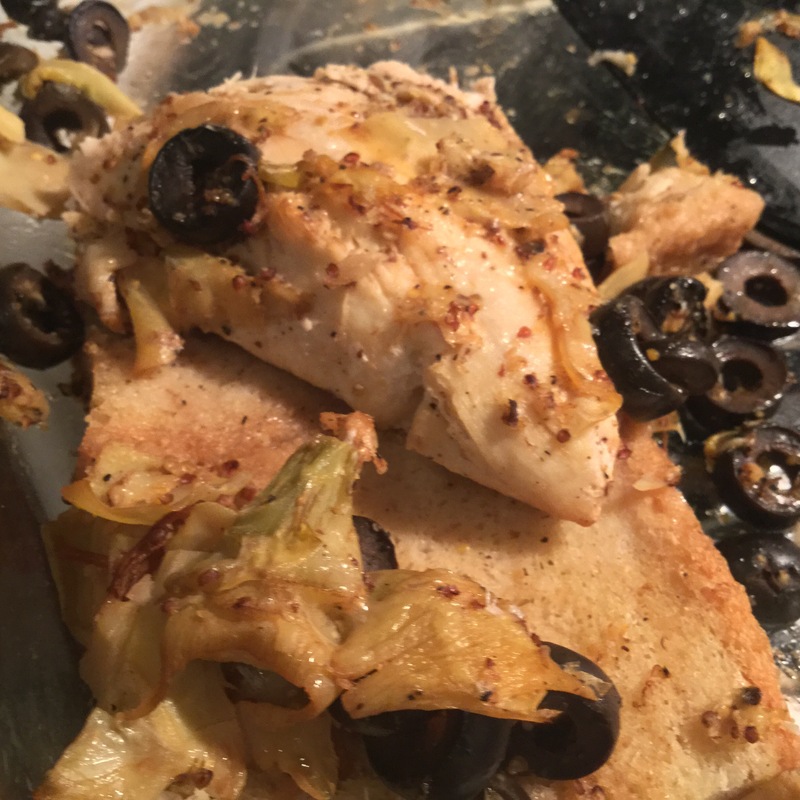 Whisk in Dijon mustard, add artichoke hearts, olives and garlic and stir. Simmer sauce and allow to reduce. This should take about 30 minutes. Add chicken back to pan and continue to simmer and spoon sauce over chicken, so it can take on some of that wonderful flavor. Preheat oven to 350 degrees. Cook chicken another 10 minutes or so. Place your bread in an oven-safe baking pan. Transfer chicken into baking pan in the bread bowl or over bread slices and then pour sauce and all contents of your skillet over the bread, trying to cover equally so all parts of the bread will soak up sauce. Bake in the oven for about 20 minutes. Ensure your chicken is cooked through, but don’t burn your bread. 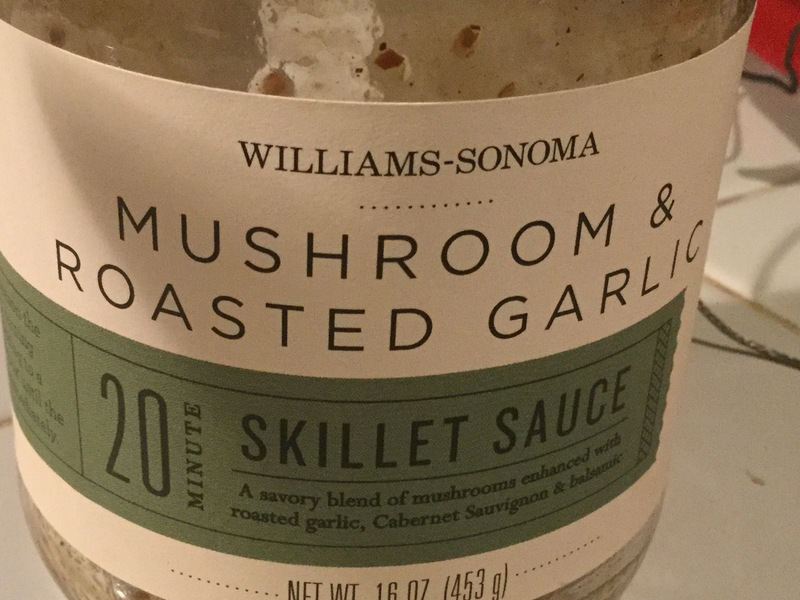 Chicken, Mushroom and Roasted Garlic Skillet – Williams-Sonoma to the Rescue!!! I recently celebrated my 50th birthday (Yikes!) and my longtime friend of 46 years gifted me with a wonderful basket filled with goodies from Williams-Sonoma. This Mushroom and Roasted Garlic Skillet Sauce was one of the delectable items in that basket. 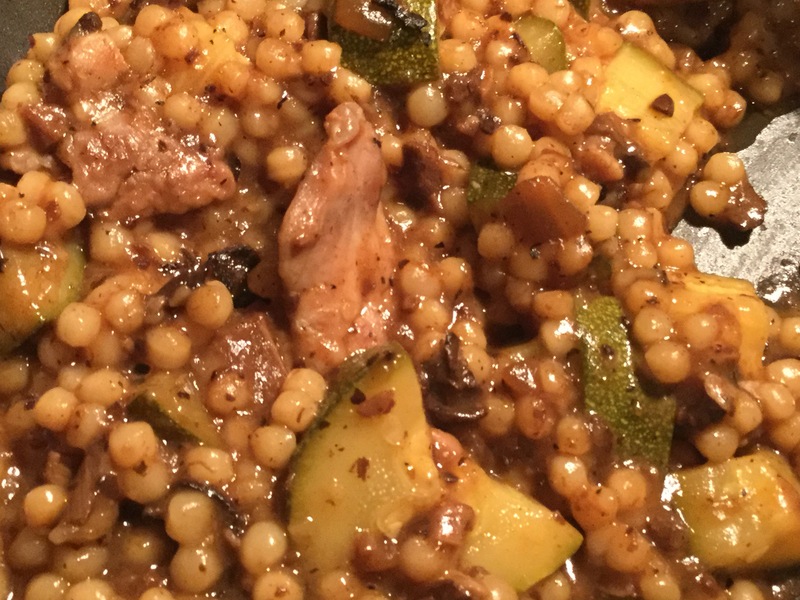 I mixed the sauce with chicken, zucchini and pearl couscous to make a fantastic one skillet meal. This sauce had a bold, savory flavor that added the perfect amount of flavor without the need for additional seasoning. It made this impressive meal incredibly quick and easy to make. This could even be altered to be a vegetarian meal by leaving out the chicken and adding additional vegetables or even beans or tofu! Cook couscous according to container directions with water or broth. Meanwhile, in a skillet sprayed with non-stick spray cook chicken until lightly browned on all sides. Add zucchini and skillet sauce and stir. Once cous cous is cooked, add this to the skillet and stir. Once chicken is cooked all the way through, your dish is ready to serve. Makes about 6 servings. This was originally posted by another blogger, but it sounded so good!!! Now that my peanut hating daughter no longer lives at home, I’m going to have to try making this!!! My sister has been telling me I need to blog this recipe, so here we are! I found this recipe in a Better Homes and Gardens magazine probably over 20 years ago and have been making it ever since! 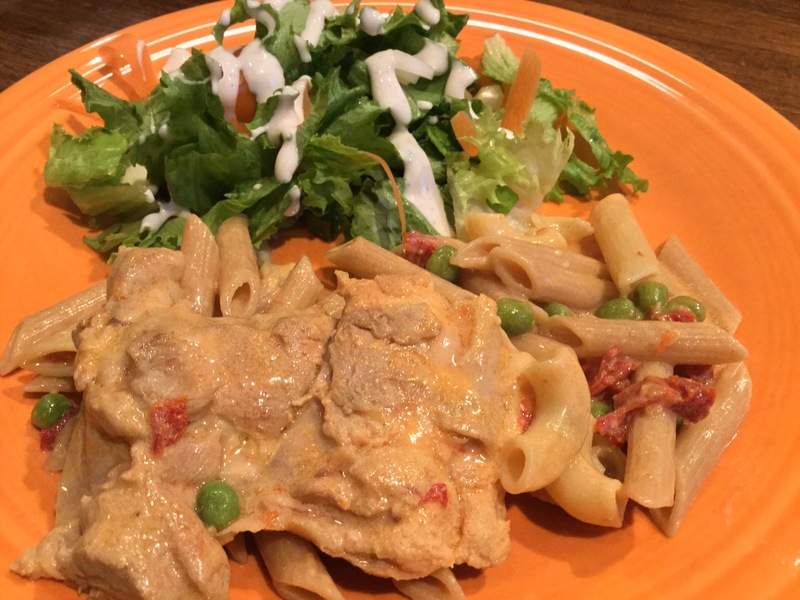 The spicy, creamy sauce over pasta and chicken is so very delicious! It has just the right amount of spice! It’s a nice enough dish to serve to company and it’s an easy dish to multiply in order to serve a large group. This was a favorite when our large family group would go to Tahoe for snowy get-aways. The teenagers loved coming in from playing in the snow to this spicy, warm dish! I chose to keep the dish as low-fat as possible by using fat free dairy ingredients. You can change it to low-fat or full-fat ingredients based on your taste. Combine 1 tbsp of the flour, salt, and ground peppers; toss with the chicken to coat. In a large skillet heat oil and cook chicken 4-5 minutes or till tender. Remove chicken; add onion, red pepper, jalapeno pepper and garlic. Cook until tender. Stir in remaining flour. Add broth, milk and Worcestershire sauce; cook and stir until bubbly. Shir in cheese until melted. Stir in sour cream. Add chicken and heat through (do not boil). Serve over pasta. Makes 5-6 servings. 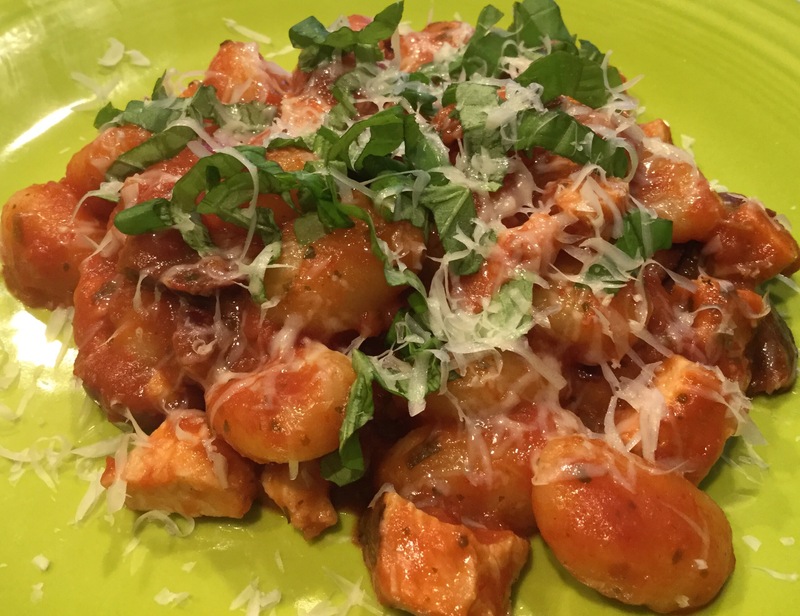 Tomato Pesto Gnocchi with Chicken and Olives – A Quick Dinner For One! On nights when my husband and daughter go to our church’s youth group, we usually just grab leftovers to eat for dinner. The other night, I was in the mood for something other than the leftover risotto we had, so I decided to get a little creative! How about gnocchi with chicken, Kalamata olives, tomato pesto and fresh basil? Worked for me! It was delicious! I had some dried gnocchi in the pantry, leftover marinara and pesto sauces and some pre-grilled Foster Farm chicken in the fridge. I almost always have fresh basil and a jar of Kalamata olives hanging around the house, so a tasty dish was coming together! Kalamata olives aren’t everyone’s cup of tea, but I loved the additional acid that they added to the dish. This dish could easily be adapted to be vegetarian or even vegan by eliminating the chicken and/or cheese. It was super quick to make (about 10 minutes) and was enough for me with 1 or 2 servings leftover. Cook gnocchi according to package, usually boiling it 3-5 minutes. In a small saucepan, warm marinara, pesto, olives, and chicken. When gnocchi is cooked, drain and toss with sauce and chicken. Serve topped with fresh basil and grated parmesan. I’ll admit it! I have a problem. 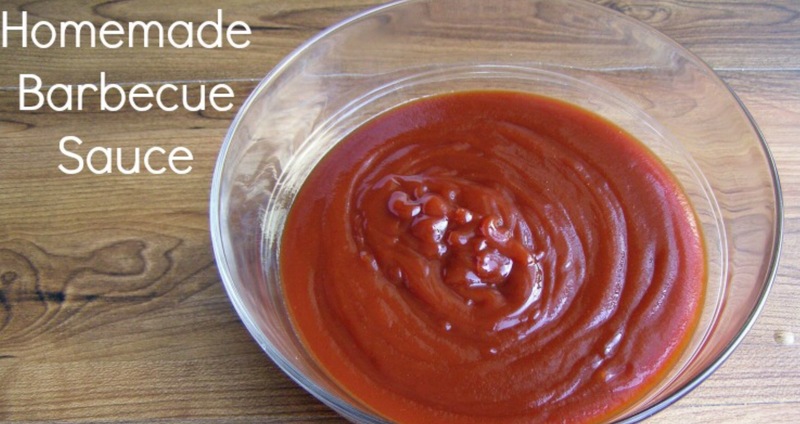 I’m obsessed with buffalo sauce on chicken wings, pasta, cauliflower, whatever! It’s just wonderful! So last weekend I was really craving it and came up with this creamy pasta recipe that incorporated Frank’s Red Hot Sauce. It was so good!!! Just the right amount of heat off set by the creamy sauce. Then you get little bursts of sweet with the peas and other bites of zing with the sundried tomatoes. Oh my I really liked this dish!!! I think I ate all the leftovers single-handedly! I know you’re probably thinking that with a cream sauce this must be calorie packed, but it really wasn’t. 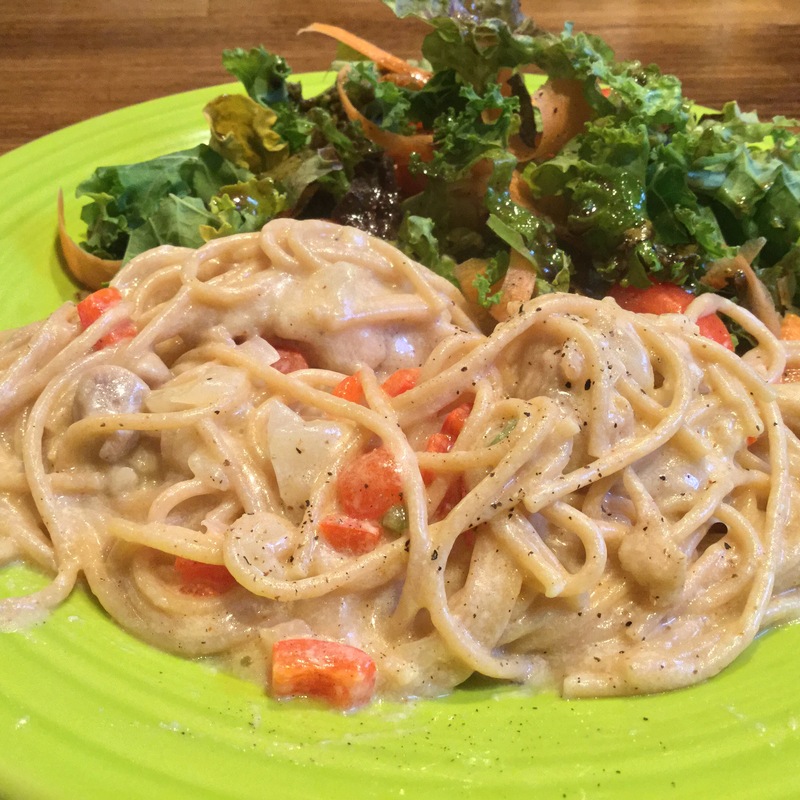 As I usually do, when I make a cream sauce I substitute fat free half and half where heavy cream is usually used. The rest of the ingredients are pretty lowfat on their own, so overall this dish packs a lot of flavor without too much fat. Marinate chicken in Frank’s Red Hot Sauce. Cook pasta according to package. Spray a frying pan with non-stick spray. Remove chicken from marinade, reserving marinade. Brown chicken in frying pan. Remove to a plate. Pour chicken broth, half and half, and remaining marinade in frying pan and simmer over medium low heat scrapping meat bits off bottom of pan. Add peas and tomatoes, stirring until warmed through. Make a slurry of corn starch and water and stir into sauce. Add chicken back to pan. Continue to simmer over medium low heat stirring as sauce thickens and spooning sauce over chicken. When sauce is thickened and chicken is cooked through, toss with cooked,drained pasta. 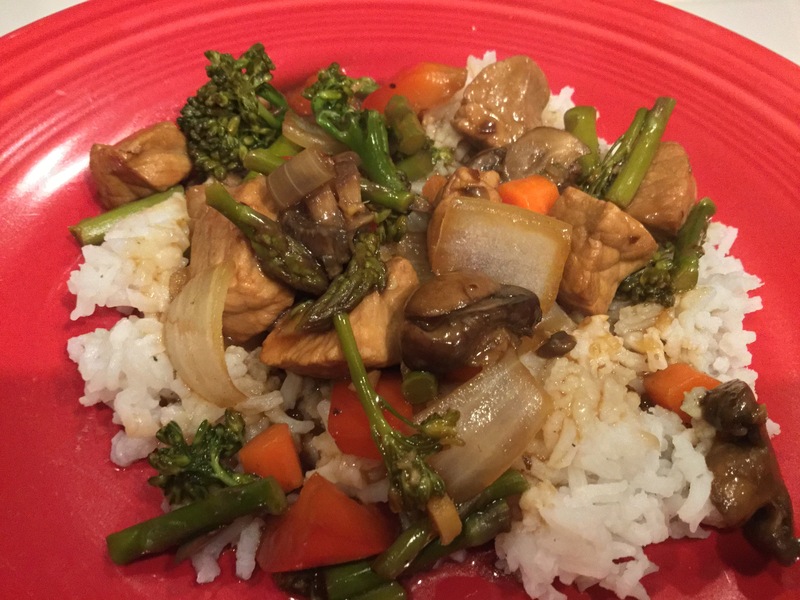 Szechuan Stir Fry – A Healthy Dinner With Loads of Flavor!!! I had bought packages of boneless pork chops marked down that were on the small side. How am I going to stretch this meat to feed my family??? Rather than serving whole pork chops, I thought I would cut the meat into bite size pieces and make a stir fry. I was faking it, but this meal turned out so delicious! The garlic, ginger and spicy Szechuan sauce made for a very bold sauce and the variety of fresh, organic vegetables gave it additional bright flavor and wonderful texture. This is definitely a dish you could play with and use whatever vegetables you have on hand. You could even use a bag of frozen stir fry veggies. I just used what I had on hand and it made for a wonderful dish that we wolfed down! The great thing about this dish is you can leave the meat out or substitute it with tofu for a vegan/vegetarian dish. Tofu would work well with this sauce! It would absorb that flavor and give you a protein boost with wonderful flavor. Cook jazmati or basmati rice as instructed by package. I made about 4 servings worth. Spray non-stick wok or large fry pan with non-stick spray, saute pork (or chicken) over medium high heat until browned on all sides. It’s OK if it’s not cooked all the way through. Remove meat from pan to a plate and set aside. If needed, give pan another spray of non-stick spray. Add all veggies and saute until tender, but still crunchy. Add broth, Szechuan sauce, and meat and turn heat down to a simmer. Simmer for about 5 minutes. In a small bowl, stir together corn starch and water and then add to rest of mixture. This will thicken your sauce. Simmer until sauce is thickened and meat is cooked through. Serve over rice. Tip: For those of you that are less-experienced cooks, the mix of cornstarch and water is called a slurry. If you don’t have cornstarch you can also use flour. You want to mix this together really well and work out any lumps, so when you add this to your sauce, you won’t have lumps, but your sauce will thicken nicely. This is good to have in your bag of tricks as you can use it to thicken almost any sauce that isn’t reducing or thickening the way you would like. Just don’t go overboard with too much as it will affect the flavor of your sauce.